Do we really need another t-shirt pattern? Earlier this week, Jen of Grainline Studio released her latest pattern, the Lark Tee. 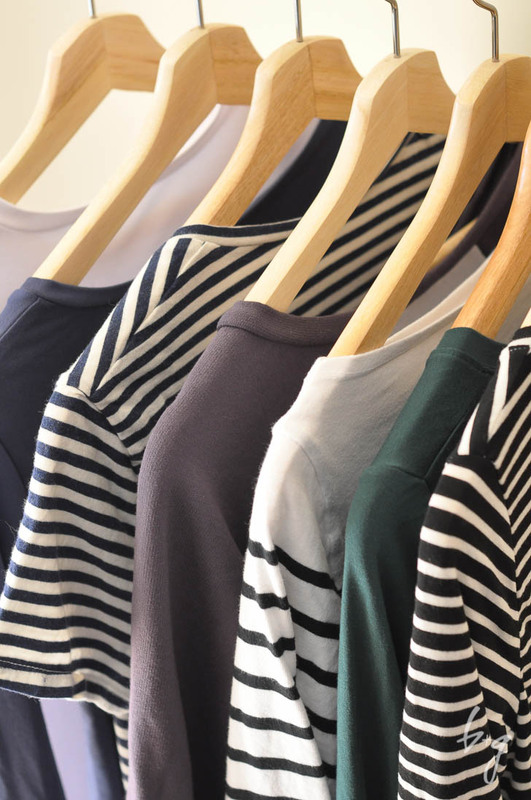 It's a basic tee with four different necklines (v-neck, scoop, crew and boat-neck) and four different sleeve variations (cap, short, 3/4 and long) for a total of 16 possible different looks. The second I saw it on my Instagram feed, I hopped right over to Jen's website and purchased it for $12. (Some people are surprised to know I purchase most of my sewing patterns - but it's true!) Later that night, I noticed that not everyone was as excited as I was about the new pattern. "Boooooring!" "But we have so many tee patterns already." "Are these indie designers just out of things to design?" Many people felt the same way I did, of course, but overall reception was mixed. It got me thinking - can we really have too much of a certain kind of pattern? Too many indie designers? In the last week alone, I've gotten emails from two Pattern Workshop students lamenting the saturation of the indie pattern market and wondering if I was concerned at all that the competition was getting too stiff for them to survive as full-time designers. Those are very basic examples, so let's go a little deeper. Why do you think some people pay $250+ for a pair of designer jeans? Is there really anything that makes them better than a pair of $50 jeans? Okay, maybe. Perhaps the denim is higher quality. Perhaps the topstitching is nicer, and the fit is better. Perhaps they were made in the USA instead of imported. But what about a pair of $250+ jeans is better than a pair of, say, a $130 pair of jeans? I'd venture to say nothing. In this case, the price is part of the branding, and the branding for designs in this price range usually has to do with a very specific benefit. It goes something like this: Wear these jeans and look/feel like a wealthy celebrity/jet setter. It's not about the spandex content of the denim or the color-fastness of the dye. It's not about whether they are bootcut or straight or if the rise is high or low. This is why designer clothing/perfume/jewelry/cosmetics ads usually features high-fashion images of celebrities doing fabulous things. It's also why lower-end product advertising usually lists features. The manufacturer of $30 jeans is appealing to a totally different sense than the manufacturer of $250+ ones or even $100 ones. This same principle applies to sewing patterns. Some designers can charge upwards of $15 for patterns, and their loyal customers don't blink an eye. It's because their customers are purchasing for the perceived benefit of owning, sewing and wearing those patterns. Theoretically, PDF patterns in particular have no tangible value because they are not a tangible good. But in practice, they are worth whatever people are willing to pay for them. So if a designer is having success marketing a pattern for $16, that is its value. The customers are purchasing the experience, not a product. Just as I've heard people complaining about the proliferation of PDF sewing patterns and the rising prices, I've heard complaints about sewing camps, retreats and workshops. One popular sewing blogger does a lingerie-sewing workshop that costs several hundreds of dollars (plus plane tickets and hotel if the attendee isn't local). I've seen tirades about how "ridiculous" her pricing is and, despite the fact that she probably has more expertise on the topic than 99.5% of us, how she has no right to call herself an expert. But you know what? Her customers don't care about the price of her workshop. They aren't buying her expertise (however much she might have). They are buying the experience. Attending one of her workshops means learning in a beautiful space, sewing on high-end machines, experiencing rare and delicate fabrics, rubbing elbows with well-known sewing bloggers and enjoying beautifully catered meals. Attendees leave the workshop with not just a new garment - but lots of memories, gorgeous photographs, life-long friendships and even business connections. No lingerie-making book or online class could deliver that same experience. Similarly, women don't fork out hundreds of dollars to go to camp to learn how to sew. They go to camp to get away from the responsibility of raising a family or working at a demanding job. They go to hang out with other sewists who are as passionate about fabric as they are. They go to have FUN (and probably to drink wine). As far as patterns go, the experience includes everything from the presentation of the booklet/pattern (if it's a paper pattern) to the quality of drafting to the fit of the finished garment. But what you might not realize is that it also includes the camaraderie on social media and the thrill of being associated with a certain pattern brand. When a designer has a good understanding of communicating benefits and creating an experience for her customers, she has the foundation to become a wildly successful businessperson, too. And when a designer consistently delivers that experience, she develops a following of "fangirls." Fangirls are people (women, in this case) who will purchase pretty much anything from the person/business of which they are a fan. They will tell all their friends about it, blog about it, post it on social media and pretty much declare it to be the best thing since bacon. I can fully admit that I am a fangirl of Grainline Studio patterns. I own almost all of Jen's patterns and can almost guarantee that I will purchase new releases as soon as they go public. There are several reasons for this. First, they are well-drafted, illustrated and explained. Second, they are practical designs that work with my lifestyle and taste. Third, they fit my body type. And finally - this is the most elusive and least-tangible one - they help me feel more stylish and like I am part of an elite group of sewists who use them. Furthermore, fangirls are forgiving. If their beloved company/brand/designer/etc. makes a mistake or releases a lackluster product, the fangirl will remain loyal (to an extent). If you are a designer, THESE ARE THE PEOPLE THAT YOU SHOULD TRY TO ATTRACT BY THE THOUSANDS. They have the ability to maintain your business and turn your hobby into a career. They are your most loyal followers and customers. Think about it. No woman takes a photo of a sloppily dressed, unhealthy, unattractive person to her hairstylist and asks for that cut and color. Instead, she asks her stylist to copy the style of the latest and greatest celebrity - oftentimes regardless of whether celebrity has a similar hair type, face shape or features to her own. This is because we buy into ideas and possibilities, not things. We purchase for the intangible aspects of products/services, and that's how fangirls are created. As one myself, I can attest that I buy based on how products will make me feel and how others perceive me for owning them. That might sound extremely shallow, but I think it's a common (albeit subconscious) behavior in all people (at least in our culture). I own lots of t-shirt sewing patterns. I own lots of t-shirts, both handmade and ready-to-wear. I'd venture to say there are thousands of t-shirts available to me as a consumer. There are $12 Old Navy ones, $40 J.Crew ones and $100 James Perse ones (and everything in-between and below and beyond). There are boxy fit ones, slim fit ones, v-neck ones and scoop neck ones. You can buy them cropped or buy them long. There are thousands of different t-shirts because there are millions of consumers all looking for different things. Our market can sustain lots and lots of t-shirt companies just as the sewing pattern market can sustain lots and lots of pattern designs and designers. Remember, too, that the the market for sewing patterns is not static; new people are entering it every day. So just because there's already a design for a t-shirt or a pair of jeans or what-have-you doesn't at all mean there's not room for more. It could just be that new sewists entering the market are looking for EXACTLY that "new" (but same) design. Or it could just be that they like the experience of one (new) brand over another. Sew Kinetic is Closed. Permanently. This is one of those posts people usually start with something like, "This post is so hard to write," or, "It pains me to write this post." Well, the truth is that it isn't. And it doesn't. I am actually quite happy to write this post. It took several months and a well-crafted financial analysis to convince my (over?) analytical, engineer husband to allow me to shut down the site. But finally, I can announce that Sew Kinetic is closing for good. Let me clarify that I don't need my husband's permission to do anything with my business. However, we operate our businesses (he has his own/ours, too) as partnerships and consult each other with all major decisions. We have very different aptitudes for business, so our business ideas are often complementary. The other issue I had was that I couldn't consistently stock the fabrics that my customers wanted. I was purchasing from a company who buys random amounts of bolt ends from companies like The North Face, Lululemon, Polartec, Columbia, etc. So, it was really nice stuff, but it was completely unpredictable. For example, I had this great, black legging fabric in the shop for a short while, but once it was gone, that was it. I had no way of getting more despite the fact that it sold like hotcakes and drove the sales of other fabrics, too. I also lacked the infrastructure to make it work. My husband and I knew we would be in one of three situations - 1) the business would take off, and there would be so much revenue coming in that we could hire people to help manage the business, and we could rent a space for the inventory; 2) we would have decent sales, but not enough to support hiring help/renting a space; or 3) the business would completely flop and be an obvious failure. Unfortunately, we were stuck at option #2 which meant I was responsible for everything - selection, procurement, transportation, listing, photography, marketing, fulfillment, website management and accounting (among other things that I can't think of at the moment). I'm used to running a business, but I'm not used to selling hard goods. I was feeling spread precariously thin with my other commitments (not to mention my family), and that was not a good feeling. So with that, I've closed the shop permanently. I do have some inventory left, and I'm not sure what I will do with it quite yet. Some of it I will use for personal projects, and some I will probably gift to sewing friends. I contemplated reducing the prices in the shop to liquidate it all, but I'm not in the position at the moment to deal with a huge number of shipments on which I'll be losing money. I'm sure my husband will encourage me to sell as much of it as I can, but I won't be doing that through the Sew Kinetic storefront. I need to see how much I have and whether it would be better to sell as pre-cut remnants or yardage (if I do end up selling it). Note: The photos of Harper and Ezra above were taken at my wholesaler's warehouse, not at my own storage facility which was my kitchen/sewing room. I hear it all the time - "You are a machine!" "Your kids are so lucky." The truth is that I'm not a machine. I sometimes don't get enough sleep. My priorities fall by the wayside. My family suffers. I am not always amazing. And as for my kids...well, yes, they are lucky to have clothes on their backs and shoes on their feet, but an unlucky consequence of having a type-A, overachieving mother/parent can often be that they get shuffled to the backburner when mommy goes into project mode. Now, this post isn't a declaration that I'm giving up on blogging or sewing or restructuring my life in any way. I've done those before - and I've found that quitting things cold-turkey when you have my personality can seriously backfire. Instead, these are just some thoughts I've had about productivity and motherhood as it relates to sewing. I'm sharing it here because it's been on my mind and to hopefully help another parent for whom this is also a daily struggle. Let me first set up the situation for those of you who might be newcomers. I have two children - Ezra and Harper - who are almost 2 and 4. I am due any day now (38.5 weeks) to give birth to our third, a little boy. Ezra and Harper go to preschool three full days a week (MWF), and they are home with me on Tuesdays and Thursdays (and obviously the weekends). My husband goes to work very early in the morning so he can pick them up in the afternoons. I drop them off in the mornings. Once the kids are in bed around 8pm each night, my husband and I have time to pursue "our" things - which for me is usually sewing. YES. I know that some people think I am incredibly lucky to have three days to myself during which I can sew and pursue my business goals and all that jazz. And then, of course, there are others who think I am neglectful and selfish for having said days. To each her own. I am a better mommy when I have time to actually FOCUS on both fun projects AND pursuing business ideas that DO bring a significant amount of income to our family. But things are about to change. We are adding another baby to the mix. Harper is starting advanced gymnastics and dance classes. Preschool days are changing and getting staggered to accommodate extracurricular activities. Naptimes don't sync up. Businesses need attention in order to stay fresh and profitable. Extended periods of sleep are few and far between. Add to that the fact that I've recently decided I want to try to make as much of my kids' wardrobes as I can, and I get OVERWHELMED. (I want to make my own, too, but I am currently on hold until I lose the baby weight.) In fact, sometimes I get plain ole burned out. I'm sure that people who follow me on Instagram think I have it totally together most of the time. I post photos of things I'm sewing on a daily basis along with pics of my kids and me on fun outings. Occasionally there will be a belly pic taken at the most flattering angle possible - cropped strategically to make me look "great for a pregnant woman" (as my husband says) or at least passable as not awful. My Instagram photos are not usually staged or perfect or in the best light, but they still present an image of productivity and good-doing for my family. But friends, Instagram is not reality. Facebook is not reality. And Pinterest is sure-as-hell not reality. Nowadays, we can carefully curate our entire lives for our online "friends." And that can become really dangerous - not just to weary onlookers who feel like less of a mom because they didn't knit all six of their kids matching sweaters from hand-spun merino wool - but also to ourselves as we struggle to maintain the image that we've so carefully created for ourselves. I have 2K followers on Instagram which to some is a TON. But I do have friends with many thousands more, and of course, there are bloggers with hundreds of thousands of strangers following their daily routines/curated selves. Do I get a high when 100+ people "like" a photo of something I'm making? Of course. Do I respond to every comment? Nope. I simply don't have time, and Instagram's interface isn't exactly the best for it. But on the dark side - do I sometimes get sad if followers "like" one photo (perhaps of my little boy) more than another (maybe of my little girl)? Yes. It's stupid, I know. But I'm a mother. It's how I'm wired. My point is that it's easy for social media to take over our persona and force us into actually being that thing we wanted - even though being that thing can be really damn hard. Blogging and actually working toward great photos has taken a back seat for me over the past few months, but I've been sewing a TON for my kids. My goal has been to accumulate a stash of tried-and-true (TNT) patterns from which I can create their wardrobes over the next few years as they grow. But just like shopping, it can become addictive. That new shirt needs a new skirt, and that new skirt needs new leggings, and then there are shoes and socks and all other sorts of considerations that must be purchased. Oh, and if you're like me, when a pattern turns out great, you want to create a whole assembly line and make one in ALL THE FABRICS because...well, because it's addictive. There's also pressure to create Pinterest-worthy, unique garments. The truth is that my kids would probably be happy wearing solid-color tees/tanks and leggings (Harper) and sweatpants and tees (Ezra) every day. Throw in a dress or two for Harper, and it would be like a party. Does she care if I have the perfect zipper installation or $40-yard Liberty fabric or that imported-from-Northern-Europe knit fabric with what-have-you block printed all over it? Do they care that I hunched over my sewing table tracing and cutting and sewing into the wee hours of the night? How about those countless hours I spend pinning stuff I find on blogs to a kids'-sewing-specific Pinterest board? Or the time I anxiously peruse the fabric store trying to find JUST the right combination of colors, prints and textures? Do they care that I just got 100 likes on Instagram on their new outfits (which undoubtedly have stains on them by now)? How about whether or not *my* creation got featured on XYZ blog?! Okay, I'll just stop talking. In fact, it's probably just the opposite. My kids suffer when I am tired and stressed out. They sense my anxiety, and it affects their behavior, attitudes and sleep. And of course, that affects me. It can become a downward spiral. Granted, my kids are really young, so perhaps they will appreciate it more when they're older. Or they may just refuse to wear handmade clothing. There's no way to know. The kids are definitely appreciative, and Harper tells people that "my mommy sewed this," but I'm sure she'd be just as appreciative of a $6 tee bought on sale at Carter's (some of which I plan to buy this afternoon) and saying "my mommy bought me this." In fact, she might like it better because of the instant gratification aspect of it. Currently, she sometimes sees works in progress for weeks before she actually gets to use/wear them. So, while I've created a significant portion of my kids' spring/summer wardrobe for this year (and continue to do so), I'll be taking my little coupon to the kids' clothing store this afternoon and doing a little filler work so I can stop stressing into the night about whether or not I've coverstitched Harper's leggings with the right color and whether or not I chose the most perfect shade of chambray to go with Ezra's handmade button-downs. They say that happiness is found in the journey - not the outcome. And it's definitely true when it comes to crafting a handmade wardrobe for your kids or yourself. You learn that certain $20+/yard knit fabrics do, in fact, pill when being worn on a playground by a 3-year-old. And you find certain designers' patterns run large or small or fit your kid's body type. And you realize that as cute as it is, maybe white wasn't the best choice for that sun dress. You learn new techniques and improve upon old ones. You get better machine and supplies and discover things like Wonder Tape. You stop taking shortcuts and start creating processes. It gets easier and more productive, and you produce better garments. And perhaps you stop creating what you WANT your kids to wear and just make what you know they WILL wear. It can be overwhelming, I know. And sometimes, when I'm overwhelmed, I make poor decisions. Personally, I have a habit of hoarding sewing supplies (instead of actually sewing) when I get overwhelmed. I might have a stack of shorts that just need elastic added to be done, but I convince myself that I need to go to the fabric store BECAUSE FABRIC or BECAUSE COUPON or BECAUSE ALL THE THINGS! I will "stock up" on $1.99 patterns that I will never sew, and I waste small amounts of money that add up to large sums. My shopping addiction of a former life (yes, that is a real thing) sometimes rears its ugly head in the form of sewing hoarding, and it's not pretty. Well, it IS often pretty...but it's not good for my family or my overall mental health. So when you find yourself up at night checking the weather and wondering how you're ever going to get all those shorts done in time for the impending season, remember to relax and think about why we do it all in the first place: our kids. If it becomes overwhelming, that's a sure sign for me that I'm doing it all for ME instead of the kids. They would be happy, healthy people wearing second-hand clothes from the thrift store if I so chose. They might even be better off - who knows! Enjoy your sewing. Enjoy your kids. And when it gets overwhelming, take a step back. And don't be afraid to buy a few $6 tees.